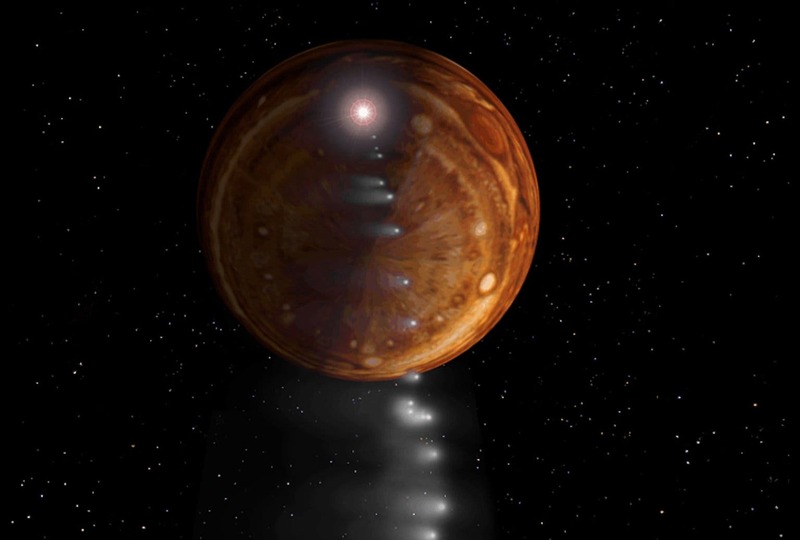 Are “Guardian” Jupiter-like Planets Needed for the Evolution of Intelligent Life? While the number of known exoplanets grows rapidly, now exceeding 500, the January issue of The Astrophysical Journal reports that 12 years of ground-based extrasolar planet-hunting observations by the Anglo-Australian Planet Search (AAPS) shows that the number of Jupiter-like planets, in Jupiter-like orbits might not be as common as previously thought. The finding is reigniting the debate about whether the presence of a Jupiter-like planet is necessary for intelligent life. The AAPS team analyzed data from 123 stars, all within 325 light years of our own Solar System and with at least eight years of observations, in search of 'Jupiter analogs' – gas giant planets on nearly circular orbits of over eight years. They found that only 3.3% of the stars analysed harbour Jupiter analogs, and the team's star-by-star computer simulations show that no more than 37% of these stars could possibly host such Jupiter analogs. "Planetary systems like our own are not ubiquitous," said astronomer and ardent planet hunter, Chris Tinney, a co-author of the study, from the University of New South Wales in Sydney. Whether Jupiter-like planets are needed has long been debated: some say that Jupiter protects Earth from civilisation-ending impacts that would frustrate evolution toward intelligent life and perhaps leave life at the bacterial level while others argue that Jupiter could just as easily send life-ending objects Earth's way. "We do not know whether Jupiter-[analogs] are necessary for intelligent life," said Alan Boss, a planetary scientist at the Carnegie Institution in Washington, DC said. "The fact that groups like this can now put together the results of 12 years of monitoring nearby stars, with a good knowledge of [their data's] accuracy and limitations, means that for the first time, we can get good numbers about the census of extrasolar planets of all types," added Boss. Geoffrey Marcy, an astronomer at the University of California at Berkeley, who has been involved in the discovery of some 250 extrasolar planets, says that Jupiter analogs' circular orbits may indeed be fortuitous for the habitability of fledgling inner solar systems. Marcy observes that gas giant planets on long, elongated orbits could cause Earth-like planets to be gravitationally perturbed into highly eccentric orbits. That would likely result in untenable swings in such extrasolar Earths' temperatures and climate. "The small occurrence of Jupiter-analogs bears directly on the occurrence of life in the universe," added Marcy. Echoing Marcy and the "Jupiter-as-Guardian" advocates, Stephen Hawking believes that one of the major factors in the possible scarcity of intelligent life in our galaxy is the high probability of an asteroid or comet colliding with inhabited planets. We have observed, Hawking points out in "Life in the Universe," the collision of a comet, Schumacher-Levi, with Jupiter (image above), which produced a series of enormous fireballs, plumes many thousands of kilometers high, hot "bubbles" of gas in the atmosphere, and large dark "scars" on the atmosphere which had lifetimes on the order of weeks. Vredefort The asteroid that hit Vredefort located in the Free State Province of South Africa is one of the largest to ever impact Earth, estimated at over 10 km (6 miles) wide, although it is believed by many that the original size of the impact structure could have been 250 km in diameter, or possibly larger(though the Wilkes Land crater in Antarctica, if confirmed to have been the result of an impact event, is even larger at 500 kilometers across). The town of Vredefort is situated in the crater (image). Note: Portions of this post was adapted from a news release issued by University of Southampton.